These beautiful mini bowls, only 2 1/2" across, are perfect for a number of tasks: capturing rings at the kitchen sink or earrings at a dressing table; supplying paper clips or other office supplies at your desk; or carrying salt and spices to the dining table. 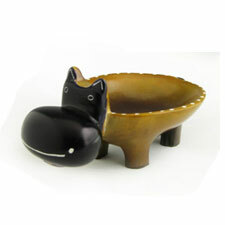 They are hand crafted of soapstone and non-toxic dyes. The highlands of western Kenya contain vast deposits of a metamorphic stone known as steatite, soapstone or kisii stone. Under the knife of a talented Gusii carver, chunks of this soft, talc-like stone can be transformed into any shape imaginable. The Gusii, or Abagusii, live in the Kisii District of Kenya's Nyanza Province, near Lake Victoria. Kisii is one of Kenya's most populated areas, and the Gusii are known to be very industrious, hard-working people. Their skill at carving soapstone, or kisii stone, has been refined over the past century. Please choose your preferred color below.